NEW YORK, New York - An estimated 3.5 million spectators and more than 50 million television viewers will watch the 2017 Macy’s Thanksgiving Day Parade hit the streets of New York City beginning at 9 a.m. Eastern Standard Time on Thursday, November 23. The three-hour event will be broadcast on NBC. 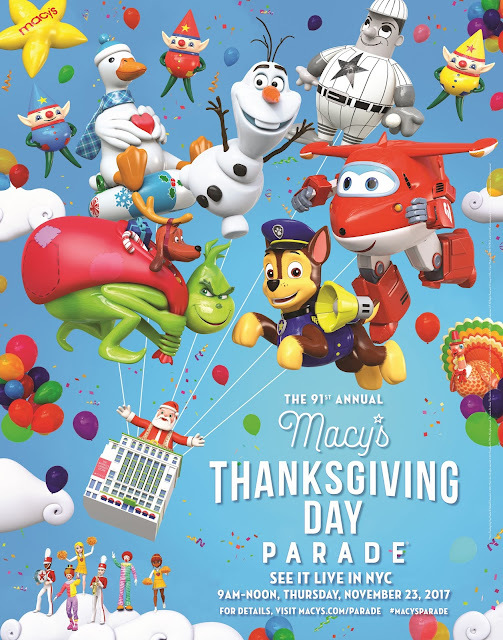 This year, Macy’s Thanksgiving Day will feature 17 giant character balloons; 28 legacy balloons, balloonicles, balloonheads and trycaloons; 26 floats; 1,100 cheerleaders and dancers; more than 1,000 clowns; 12 marching bands and six performance groups. This year, four giant characters will debut including Disney Frozen’s Olaf, Illumination presents Dr. Seuss’ The Grinch, PAW Patrol and Jett from Super Wings. The balloon line-up will also feature the return of Harold the Baseball Player, a legacy Macy’s character prominently featured in Twentieth Century Fox’s iconic holiday film classic, Miracle on 34th Street.